Maurice Berger, the founder of LAMPE BERGER, was a pharmacist in the late 19th century. He was inspired to invent a product that would improve the quality of air after witnessing the dismal conditions in hospitals plagued with stagnant air and poor ventilation. After much research, he succeeded in inventing a product that would provide a fresh and pleasant environment. Used for decades in medical environments only, because of its antibacterial powers, it was realised that by adding fragrance the lamp had a whole new function. It is now a worldwide brand with a huge range of bottle designs and a large variety of fantastic fragrances. Easy to use and very safe, after the initial lighting there is no naked flame as the heated catalytic converter vapourises the oil until air is excluded by placing the metal snuffer over it. Each Lamp comes as a gift box set which includes; The Lamp in a fabric gift bag, wick & stone burner unit, openwork shade, cap, fragrance funnel and instruction booklet. 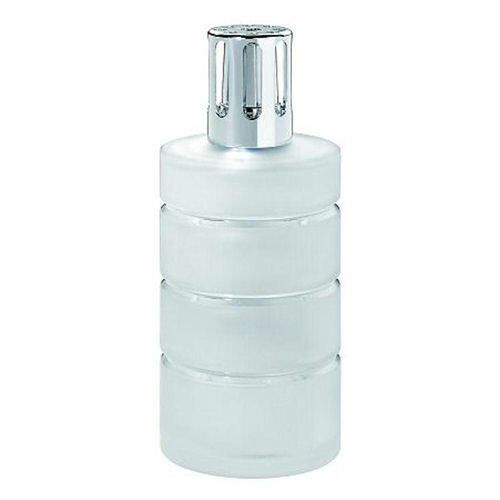 This stylish Lampe Berger will fit seamlessly into the modern home. Now £32.80 Qty: 2 In-stock.